Posted on October 20, 2011 at 10:23:59 am by Lauren C.
What&apos;s the next best thing to The Beatles? 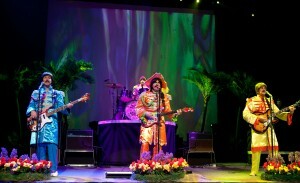 A Tribute to to The Beatles! RAIN – A Tribute To The Beatles will bring the music of the "Fab Four" to the Embassy Theatre stage Tuesday, November 8, 2011 at 7:30 p.m. RAIN performs the full range of The Beatles&apos; discography live onstage, including the most complex and challenging songs that The Beatles themselves recorded in the studio but never performed for an audience. The band promises to deliver a spot-on, note-for-note show, performing such classics as "I Want To Hold Your Hand," "Hard Day’s Night," "Sgt. Pepper’s Lonely Hearts Club Band," "Let It Be," "Come Together" and "Hey Jude." Tickets for RAIN are on sale now and start at $27.50. Tickets can be purchased at the Embassy Theatre box office, by visiting Ticketmaster.com, or by calling 1-800-745-3000. Discounts are available for subscribers and groups of 20 or more by calling (260)424-5665. RAIN – A Tribute To The Beatles features Dine & Ride, a FREE park and ride program to help you enjoy dinner and a show downtown. AND - You can win a "Broadway at the Embassy" Getaway for Two! Click here to sign up to win!